Former England seam bowler Tom Cartwright has died at the age of 71. The right-armer played five Tests for England in the mid 1960s, taking 15 wickets at 36.26. 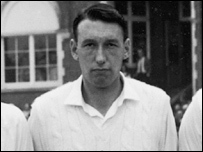 Born in Coventry, the son of a car industry worker, Cartwright made his Warwickshire debut aged 17 in 1952 as a specialist middle-order batsman. But Cartwright soon established himself as a bowler, playing for Somerset from 1970-76 before joining Glamorgan as player and cricket manager. Cartwright stayed at Cardiff until 1983 and eventually settled in Neath. In later years he was director of coaching for the Welsh Cricket Association, also working for the Cricket Board of Wales, and was made an MBE in 2000. Cartwright made his Test debut in the fourth Test against Australia in 1964, taking 2 for 118 on a pancake flat Old Trafford pitch. He was retained for the fifth Test at the Oval where he returned 3 for 110 and then toured South Africa that winter where he played one Test. Cartwright added his final two England caps the following summer, making one appearance against New Zealand before taking his Test best of 6 for 94 in his last appearance against South Africa at Trent Bridge. He took 1,536 first-class wickets at 19.11 runs apiece and also scored 13,710 runs at 21.32 with seven centuries, including a double ton. But Cartwright proved to be an even better coach and is widely credited with being instrumental in the progress of a young Ian Botham during his time at Taunton. Cartwright had been seriously ill since suffering a heart attack in mid-March.